Our Shareware Solutions to try or buy! An Ident daemon is run to allow access to certain features on the Internet, such as Internet Relay Chat (IRC). This small utility acts as a server, running in the background, answering Ident requests. This program disables the Windows Key on Win95 keyboards, as well as the Ctrl-Alt-Del, Alt-Tab and Ctrl-Esc key sequences. Includes security to keep people from disabling the program without the password (User-definable). Known Problems: If you are running a full screen app which uses DirectX 7.0, the WinKey functions will not work! We are currently working on a solution, and will post it here as soon as it becomes available. This does not affect apps which are not run in full screen. 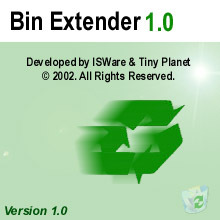 Bin Extender adds functionality to the Recycle Bin by showing an extra icon when the Recycle Bin capacity goes above a user-specified limit. The program will also allow you to specify what style of Bin you wish to use. You can choose between the Standard Windows 9x/NT, ME/2000, or XP icon set. Changes are made on the fly, no rebooting necessary! Future Features: Unknown, this is still the first version! This is a small program I wrote while I was on IRC. It became apparent to me that I needed a quick and easy way to find people, and get info about them. This was the answer. This took me a bunch of work, so this one is shareware. This program will strip the control codes out of log files created by mIRC, and IRC Chat client. Saves a bunch of space on your hard drive. Note: This program is discontinued. You may download an activation code to make it fully functional, but there will be NO future updates. This utility was designed SOLELY for use with the NWS files created by Microsoft Outlook Express newsreader when you drag a news article (with an attachment) to your system. It will decode and detach and attachments it finds, with the exception of multi-part attachments. Decoder is meant to work on the files that you can Drag and Drop onto your desktop or into another folder. It is not meant to work directly on the Database files. This program will batch rename any selected group of files, or an entire folder to a numeric order, or a user defined prefix. Yanno those Tamagotchi things?? Well, here's one for your PC. Small program that asks you for an answer to simple math problems. So far all of the basic math applications are covered...Add, Subtract, Multiply, and Divide.